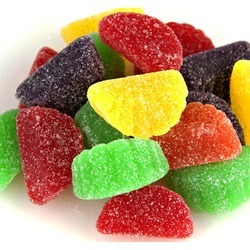 These colorful Assorted Fruit Slices come in cherry, orange, lime and lemon flavors. Sanded with sugar. Ing. : Corn Syrup, Sucrose, Food Starch- Modified, Dextrose, Natural and Artificial Flavors, Red 40, Yellow 5 and Blue 1.